Cycas pruinosa in habitat in the Deception Ranges. Glaucous leaf waxes may be either present or absent, causing plants to be either blue or green in overall appearance. 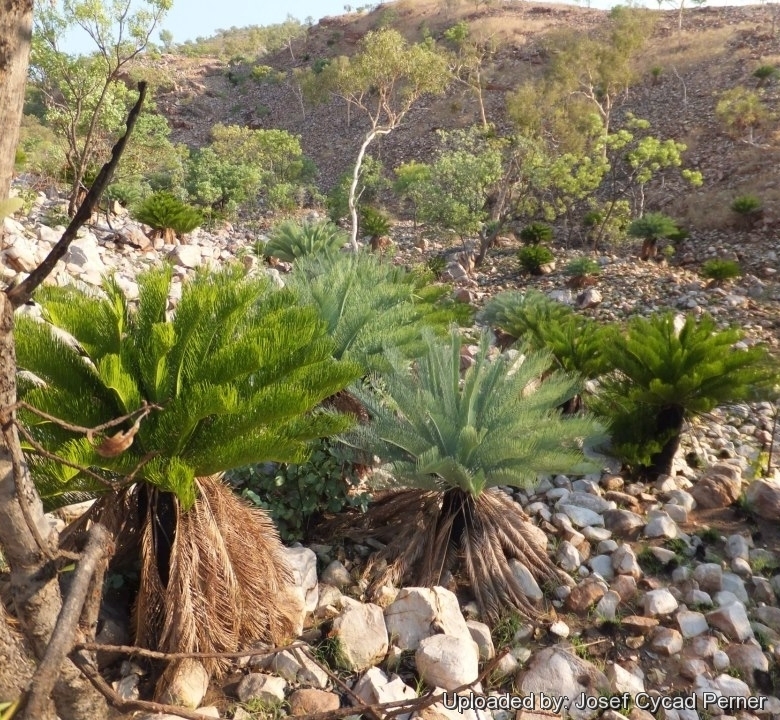 Origin and Habitat: Cycas pruinosa is a widespread but sporadic species in the eastern and southern Kimberley region of Western Australia. Found near Kununurra, Ord River, Bedford Downs and on the Napier Range. Also occurs in the Spirit Hills on Bullo River station in the Northern Territory, Western Australia. Habitat and Ecology: This small woodland understory plant is found in dry areas on laterite or siliceous substrates, from meta-sandstones to granites often on sloping hill and gorges along ephemeral watercourses. It is locally abundant and there are no threats to this species. The area is frequently burnt. Fires, on average, occur in two out of three years in any one place, but the trunk of Cycas pruinosa is covered in old leaf bases that makes adult palms quite fire tolerant. The plant will immediately start to produce new fronds if the old ones are burned off or badly scorched. 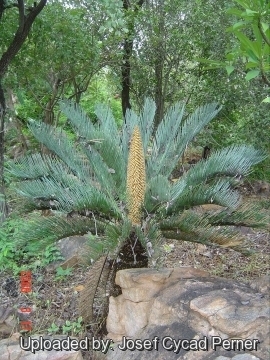 This cycads is subject to a hot wet season followed by a hot dry season. Dry season temps are consistently around 32-33° C, with cooler nights averaging around 15° C or higher. During the transition between wet/dry seasons temperatures are often up to the low 40's and sun intense. 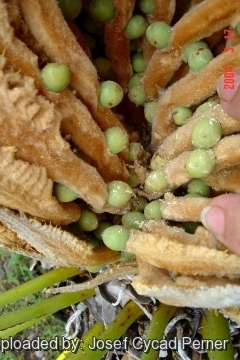 The seeds are usually carried around by marsupials, they take them to rocky overhangs so they are protected from birds of prey of Dingoes to eat the outer fruit of the cycas seeds, the seeds will germinate in the shelter and hopefully finf fertile ground in which to grow, most likely the seeds will be eventually eaten or will germinate in a hostile area and fail. 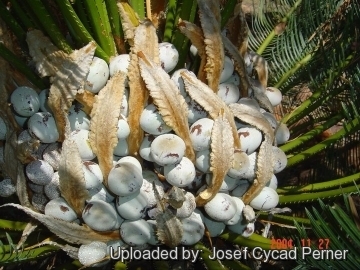 Description: Cycas pruinosa is a small to medium, dioecious, palm-like plant up to 2 m in heigh, crowned with arching fronds, distinctly curved from the apex and V-shaped in cross-section with narrow, glabrous leaflets with strongly revolute (recurved) margins. Cycas pruinosa is quite variable over its extended range, with very few scattered habitats in which distinct differences in the habits of the plants are evident, there are colonies divided by hundreds of Km that are deserving of at least subspecies recognition. Glaucous leaf waxes may be either present or absent, causing plants to be either blue or green in overall appearance. This two distinct colour forms of plants growing in basically the same areas are known as “blue form” and “green form” through certain intermediate degrees of colour. Leaves (fronds): 0.8-1 m long, keeled and with an average of 120 pairs of pinnae on each rachis. Pinnae narrow (less than 4 mm wide). Margins of pinnae strongly revolute. Pinnae and rachis, are glaucous bluish grey in most specimens, but variously leaning toward the blue or dark green. Trunk: Stout, erect 0.6-2(-2.5) m tall and 30 cm in diameter. Cones: It is a dioicus species and each plant produces only one cone at a time. 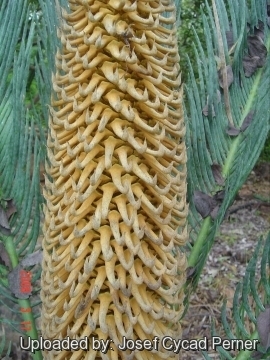 Both male and female cones are blue/green turning yellow-orange at maturity except in fully shaded situations and are always covered with a thick waxy bloom. Female cones: The newly emerging megasporophylls (modified leaf on which the megaspores or ovules are formed) are rusty brown with long, sterile apexes and when fully extended recurve backward having a coating of blue white powder on all seed ovules. The formation of seed and toothed megasporophylls in the apex of the female crown is very interesting and has some likenesses to the exotic Cycas revoluta. Seed: Heavily powdered, about 40 mm long and 35 mm in diameter. Similar species: Cycas pruinosa differs from Cycas calcicola in the absence of indumentum in the channels on the undersurface of the pinnae, in the U- to V-shaped versus of pinnae. The pronounced visual similarities these plants have to the exotic Cycas revoluta is even more so in the green form. Apart from the now well known similarities of the narrow revolute pinnae and the 'nesting' crown habit of the megasporophylls, this Cycas produces many offshoots around the base of the caudex as is common in such exotic species as Cycas revoluta, Cycas circinalis and Cycas rumphii. Notes: This strikingly distinctive and widespread species was only first recognised in 1978 by Australian botanist John Maconochie. Pruinosa means “hoary, covered with hoar frost” and aptly describes the pruinose surface of the magaspores (ovules) of this plant. 4) Hill, K.D. 2010. 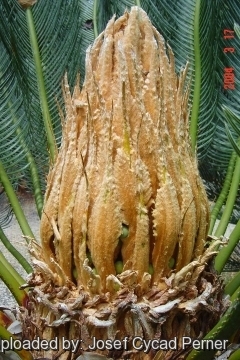 Cycas pruinosa. The IUCN Red List of Threatened Species. Version 2014.2. <www.iucnredlist.org>. Downloaded on 29 July 2014. 5) Wikipedia contributors. 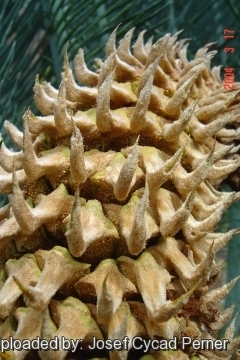 "Cycas pruinosa." Wikipedia, The Free Encyclopedia. Wikipedia, The Free Encyclopedia, 13 Mar. 2013. Web. Downloaded on 29 Jul. 2014. 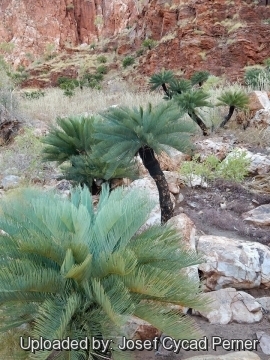 8) The Palm and Cycad Society of Australia [http://www.pacsoa.org.au/w/index.php?title=Cycas_pruinosa&oldid=29172] Downloaded on 29 Jul. 2014. 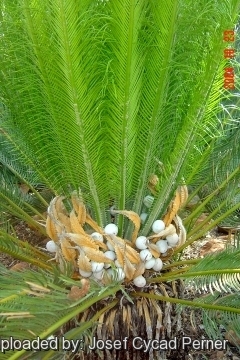 Cultivation and Propagation: Cycas pruinosa is suited to tropical regions which have a seasonally dry climate. It is easy to grow, tolerating dry periods, but up to the time of this writing this species is not common in cultivation.